This is the first of a series of posts designed to bust the myths created by the Treaty of Waitangi grievance industry — myths shamelessly presented as truths by your government. If you think it rude of me to expose these facts, tough. If conmen are going to tell lies about my forefathers, I’m going to tell the truth about theirs. Much of what you see below is distilled from New Zealand in Crisis by Ross Baker of the One New Zealand Foundation. Maori history tells of seven canoes arriving from Hawaiki in around 1350AD. They find New Zealand already inhabited by people they call the tangata whenua. These first inhabitants are either driven into extinction or merge with the tangata Maori (just as the tangata Maori have merged with the Pakeha). Thus Maori are not indigenous to New Zealand. Nor are they the tangata whenua — the first people here. Indigenous means here from the start — like the aborigines who’ve been in Australia for 40,000 years. Maori have been here only about 650 years — only 300 years longer than Europeans. Maori have never been a united people, with a long history of inter-tribal bloodletting. Ranginui Walker: “From this time on [the 14th century] , the traditions abound with accounts of tribal wars over the land and its resources”. In 1771 in the Bay of Islands, Maori kill Marion du Fresne and 24 of his party for ignoring wahi tapu when fishing. In retaliation, du Fresne’s crew kill 250 Maori and torch their village. Ever since, the Maori are afraid of the French. By 1820, the Maori v Maori Musket Wars have been raging for around 15 years. They will go on for about another 25 years. There are around 500 battles in all. In 1820, Ngapuhi chief Hongi Hika sails to England. He asks the King for muskets. The King declines, but presents him with other gifts. In Sydney on the way home, he trades all the King’s gifts for 300 muskets and gunpowder. He then leads his tribe on a rampage south. They slaughter 20-60,000 of their defenceless countrymen, out of a total Maori population of 100-120,000. With up to half the population wiped out, it has been called the world’s worst holocaust. In one attack on the Tamaki pa, Ngapuhi kill more men, women and children than are killed in the whole 27 years of the 1845-72 Land Wars. By 1830 the southern tribes have armed themselves with muskets and are planning to head north for revenge. The Waikato travel south and attack the Taranaki tribes. They kill one-third and enslave another third. The remaining third flees south to the Wellington area. In 1831, it’s rumoured that the French naval vessel La Favourite intends to annex New Zealand to France. The French would have two reasons for doing this: as further payback for the killing of du Fresne and his crew; and to protect the French now living in Hokianga. The natives decide to place a British flag on the mission flagstaff. They reason that if the French tear it down, the missionaries will appeal to Britain for protection. Thirteen northern chiefs write to the King of England, asking him to protect them. They tell the King they only trust the British: “It is only thy land which is liberal towards us”. They reveal their fear of the French: “We have heard that the tribe of Marian [the French] is at hand, coming to take away our land”. They ask the King to guard their lands from other tribes and nations: “Therefore we pray thee to become our friend and the guardian of these islands, lest the teasing of other tribes should come near us, and lest strangers should come and take away our land”. At the time there are no property rights. To the Maori, might is right — they hold their land only as long as they can defend it. The King acknowledges the chiefs’ request by sending a British Resident, James Busby, to New Zealand in 1833. New Zealand-built ships are sailing to Sydney. These ships are not registered, so have no flag to sail under. So James Busby introduces to the northern tribes a Declaration of Independence. This gives them a form of identity, and a flag under which New Zealand ships can be registered. In 1835, thirty-four Ngapuhi chiefs sign the Declaration of Independence. This declares their territories independent states. It states they will meet in Congress each year. The annual Congress is meant to make laws to dispense justice, preserve peace and good order, and regulate trade. But, as always, inter-tribal fighting takes precedence over political co-operation. The Declaration is abandoned without one Congress meeting being held. The Declaration can’t give full sovereignty, as the chiefs can’t form a united working government. Tribes only have power over their territories as long as they can defend them. No united political structure exists in New Zealand at this time. “Even though the declaration asserted sovereignty, Maori, who saw themselves as tribal rather than as members of a nation, would have been unable to exercise full rights as an independent state, there was no indigenous political structure upon which to base a united congress. “However, it did introduce Maori to the idea of a legal relationship with Britain and therefore, five years later, to the Treaty of Waitangi”. “The Declaration had no reality, since there was in fact no national indigenous power structure within New Zealand”. King also pointed out that some of the United Tribes were at war with one another within a year of signing the Declaration. “The Declaration represented a regional goodwill agreement rather than a national document of truly constitutional significance”. 1835 — Maori massacre Moriori in Chathams. In 1835, 900 of the Taranaki (Ngati Mutunga and Ngati Tama) who flee to Wellington, want to avoid being harassed further. They commandeer the brig Rodney and sail in two trips to the Chatham Islands. Many are sick when they arrive, and are nursed back to health by the peace-loving Moriori. When they recover, and for the next seven years, the Maori slaughter or farm the Moriori to near-extinction. Historian Michael King: “They were laid out touching one another, the parent and the child. Some women had stakes thrust into them; they were left to die in misery. The rest farmed like sheep over the next few years into virtual extinction”. In 1837, inter-tribal fighting worsens in many parts of New Zealand. Busby can do little to stop it, as he has no forces. The settlers, traders and 192 chiefs want more official commitment. They appeal to Britain for a better type of Government. As inter-tribal fighting worsens, the Maori population plummets. Musket- and goods-hungry Maori are selling vast tracts of their land to land-hungry Europeans. Britain is twice asked (in 1831 and 1835), and twice promises, to protect the people and their property. To bring law and order to both Maori and non-Maori, Britain is obliged to take more control. To do this legally, they need to make New Zealand a British Colony. To make New Zealand a colony, Britain has to get the chiefs’ consent to sovereignty over the whole land. For two years, the Colonial Office debates the best way to become involved in New Zealand. The British don’t really want another colony. With extreme reluctance, the Colonial Office sends out William Hobson, a highly ranked Officer in the British Navy. Hobson’s job is to negotiate a treaty with the chiefs that will give Britain sovereignty over the whole land. That treaty will give Britain the legal right to set up a government. A government will bring law, order and protection. It may investigate and settle land sales, titles and disputes. The government will act for all the people of New Zealand, settler and Maori alike. Next: the drafting and signing of the Treaty. For now, I urge you to click on the Comments thread below. It has attracted some experts in the field who have spent decades studying this subject. I’m finding their contributions enlightening. I coined the word Maorification with the deliberate goal of getting it into the language. When ACT declined to use it, I decided to use it myself. To me, no word less blunt — no euphemism like the racialisation preferred by my friend Stephen Franks — can do justice to the process by which New Zealand is being taken over by radical Maori. Every day, I wonder whether it was the right thing to do to use that word. It goes without saying in this topsy-turvy land that it would get me branded a racist. Anyone who refuses to agree that Maori should own New Zealand out to the 200 mile limit is branded a racist. But I think it was the right decision. Like it or not, Maorification is the right word. Because this reverse takeover of the silent (and silenced) majority by a noisy, intimidating minority is real. It’s affecting and infecting every institution in our society. And if we don’t jolt people into recognising the extent of it, it will soon be too late. A government plan to dovetail New Zealand into tail-wagging Maorification must be resisted. If mishandled, the continued insidious encroachment into national affairs of the Treaty of Waitangi, its floating and fanciful “principles,” and craven kow-towing to a tax-draining minority, will impede – not enhance – economic development. Foreign and onshore investors, as well as trading partners, may think twice when they see a country regarded as multiculturally stable embark on a path fraught with the prospect of racial privilege. Thanks to Maori and appeasing politicians, New Zealanders remain unnecessarily confused and at odds over a myriad of so-called “Maori issues,” including the true status of the foreshore and seabed, for example. Confused largely and quite deliberately by Appeaser-General Chris Finlayson — champion (when he wants to be) of plain English law. Conflict continues over ownership of natural resources. The rabid property demands of Tuhoe – who want their own private fiefdom in the hills – are evidence of a brand of racial separatism that has no place in New Zealand. This uncertainty for the majority has now spilled over into who may use national symbols such as the silver fern, who may perform a haka and who pays for clipping the lucrative koha ticket. I prefer to use the true meaning of koha: ‘bribe the tribe’. Let’s be honest, when a sum of koha can persuade a taniwha to return to its lair (as happened with the Waikato Expressway), we are dealing with an extortion racket. Collectively, various Maori demands have been accommodated to such an extent that the pendulum has swung too far toward a minority at the risk of damaging the national good. I use the pendulum analogy too. It’s about balance and fairness, and we cannot strike a fair balance when so much of the truth about the Treaty and its signatories remains unknown by the public. This includes the size of parliament, length of the electoral term, Maori representation, the role of the Treaty and whether a written constitution is needed. While some objects are worthy of careful consideration on behalf of all New Zealanders, the blatant swing toward matters favouring Maori should give cause for concern. Maori Affairs Minister and Maori Party co-leader Pita Sharples, for one, sees consultation with Maori and the place of the Treaty in just about everything as a priority. It is evidence of the strong pro-Maori slant that the panel will report to Dr Sharples and Deputy Prime Minister Bill English. In the proud National tradition of allowing the Maori Affairs Select Committee to hear submissions into the Marine and Coastal Areas Bill! While the panel’s musings and recommendations could simply be ignored, this is unlikely given its influential Maori imbalance. 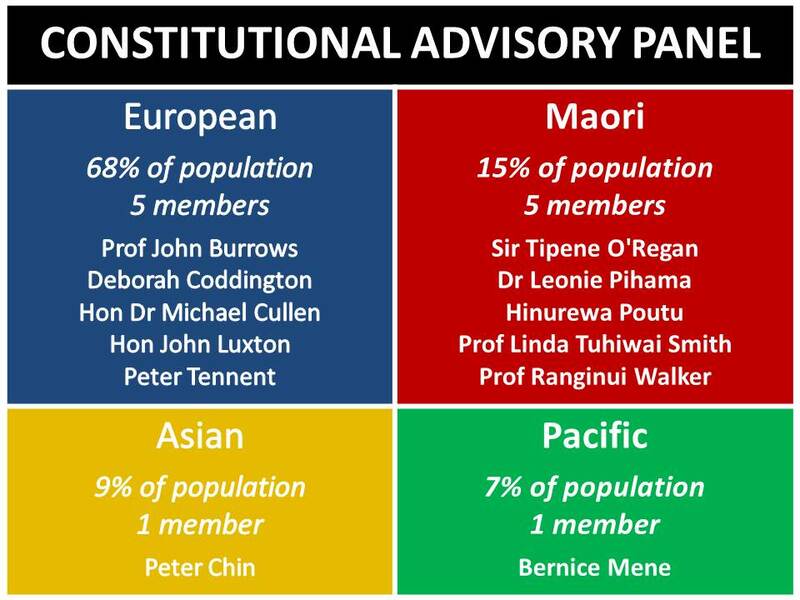 With five “non-Maori New Zealanders,” five Maori, one Pacific Islander and one of “Asian ethnicity,” the panel is, on the surface, stacked against more than three-quarters of the population. I see they had the same trouble I had with the MSD stats inflating the total to 109%. The 77% actually includes ‘Other’ and ‘New Zealanders’, so I thought it safer to use the number 68%. But it makes no difference to the point they’re (and I was) making. 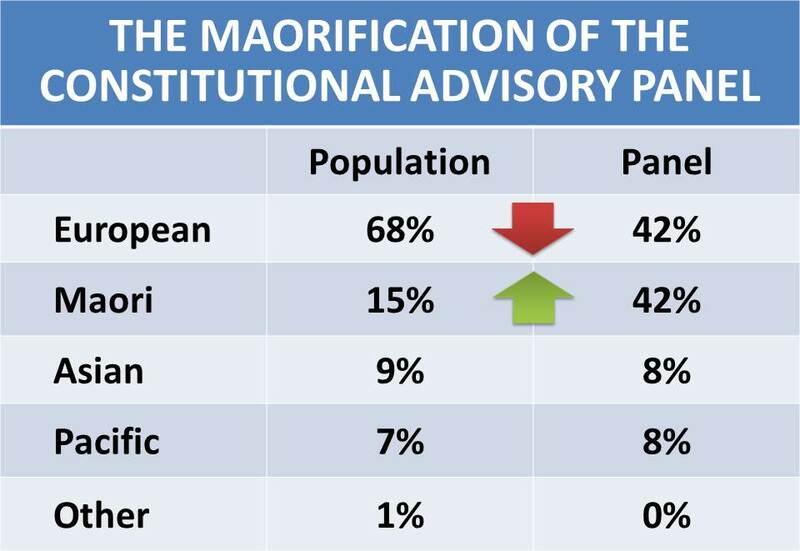 While Vote Maori will contribute $500,000 and the Ministry of Justice $1.5 million to pay for this panel, Maori get a greater say than their representation in the general population. Economic growth and investment confidence should not be threatened or undermined by the potentially nation-fracturing agenda of a minority. It’s fair to say most New Zealanders believe the present constitutional structure works, based largely on the proven democratic Westminster system and backed by the rule of law. And more of them need to say so. That’s why this issue needs to be front-footed. People need to learn not to be silenced by the threat of being called racist. That’s a trick, and it’s worked a treat, and it’s high time it stopped working. While Maori continue to be over-represented in the unemployment, child abuse, drug using, anti-social and general criminal offending stakes, some hotheads have demanded farcical “rights” over land and citizenship. These demands, while nothing more than thinly disguised racial separatism, if met would still require all other New Zealanders to pay for them. While a constitutional advisory panel should act in the interests of all New Zealanders, the racial bogeyman already stalks the land. I dont believe it ! Is it possible that finally the little kiwi can face up to the reality that enough is enough. Waiting for the usual chip on shoulder cringe pc set to do the usual in defense of their wallets….But maybe the taniwhas just a worm due for turning. Thanks to reader Graham for alerting me to the NBR. Appeaser-General Chris Finlayson wants to pay the descendants of Te Rauparaha $10 million of your money for the loss of their right to capture, kill and cannibalise the Maori of the South Island. Mr Finlayson has made an offer for a Treaty settlement to Ngati Toa, which includes a payment of $40 million, plus $10 million in recognition of Ngati Toa’s former marine empire, $6.31 million for capacity building and an additional amount of $100,000 as claimant funding (the Government also promised to support applications for resourcing from the Crown Forestry Rental Trust). Ah yes, the CFRT — the agency that refused to pay Robinson for his research on Maori depopulation until he’d reversed his conclusion to echo their politically-correct view of history. But how intriguing that Ngati Toa possessed a ‘marine empire’ — presumably patrolled by a blue-water navy. And not exactly for peacekeeping purposes, as we shall discover in a future post. And how intriguing that the supposedly Honourable Chris Finlayson intends to give $10 million of your money to Ngati Toa for the loss of this marine empire? I know Chris Finlayson. We were on good terms until I realised that he, along with John Key, were traitors intent upon giving my country back to its former owners, with no payment for improvements. He is also a master lawyer and self-styled champion of plain English. He has the skills to say exactly what he means with deadly precision. When he wants to. But this time — as with so many of his pronouncements on matters Maori — he doesn’t want to. So I’ll say it for him. 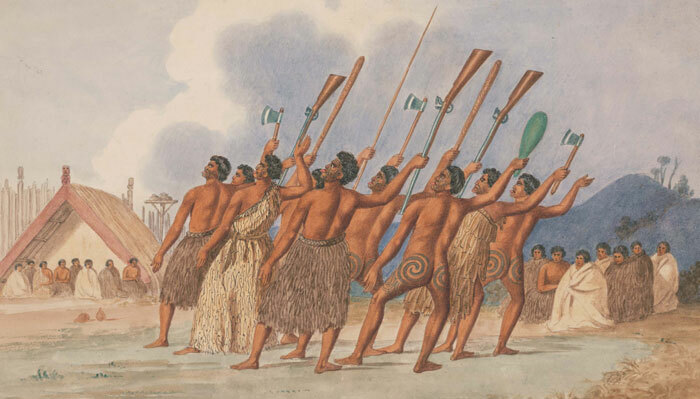 By ‘loss of Ngati Toa’s marine empire’, Finlayson means the loss of the right of these Taranaki invaders (who wiped out the tribe that had been here for centuries) to paddle across Cook Strait and slaughter, enslave and feast upon the South Island Maori. Compensating the descendants of their chief cannibal, Te Rauparaha (whose depraved devourings earns him a separate post), for the loss of that right is going to cost you and me $10 million. And that’s just the appetiser for a much larger Ngati Toa claim. As part of the package developed to recognise Ngati Toa’s maritime empire, the Crown offers to explore the development of a redress instrument that recognises Ngati Toa’s role as Kaitiaki of Cook Strait and the coastal marine area in Port Underwood and Pelorus Sound… and supports Ngati Toa in developing a statutory plan articulating Ngati Toa’s values in relation to these areas. While most of us cast our vote and make submissions, the Ngati Toa extended family will have the right to prepare management and planning documents — all because of the warfare of ancestors 190 years ago. And not just warfare. Also the cruellest imaginable slavery and cannibalism — including the eating of women and children. And for these despicable acts, plus wrongs done to them by the evil white man that Finlayson has yet to reveal (or should that be invent?) the tribe is to be rewarded. By you. It is strange and indeed corrupt to make such a generous offer of taxpayers’ money without settling the grounds for the complaint. Surely not? Yet that’s exactly what’s happening. Finlayson wants to pay $10 million of your money to a tribe for no reason he is prepared to divulge. Here the truth of what happened in a past century is not to be determined by historians in an open and public debate, but written by the aggrieved party, about to profit from a settlement based on a biased interpretation, behind closed doors and after the settlement is agreed. You read correctly. Your head lawyer is rewriting the tribe’s history with the tribe, behind closed doors, in order to concoct a reason to pay the tribe with your money for something your forefathers almost certainly did not do to their forefathers. What kind of an idiot is Chris Finlayson? Answer: a ‘useful idiot’. So even the ridiculously pro-Maori Waitangi Tribunal does not agree with the Appeaser-General that Ngati Toa possessed a blue water navy. The Maori had the great luck that the colonial power was 19th century Great Britain. Damn right they did. Imagine if they’d run into the Spaniards. Or the Belgians. Or, worse, if the tables had been turned and the Maoris had colonised Britain. Imagine that. Would they have treated with the inhabitants — or on them? The concept of citizenship developed through the Cromwell revolution, the Glorious Revolution, the French and American revolutions, and the calls to end slavery (which succeeded across the British Empire in 1833) had become accepted. The British, like all races, had a bloodthirsty history. But by 1840, they’d put their piracy and slavery behind them. British politicians and the Colonial Office wanted to work with other peoples and respect their rights. Article Three of the Treaty of Waitangi promises that equality. That promise of equal rights by the then-greatest civilisation on earth to a population of Stone Age tribesmen was evidence that the British, far from being the bully boys of modern myth, were in fact the most compassionate of colonisers. But equality is nowhere near good enough for the Maori leaders of today. They quite sensibly prefer the reverse takeover model — especially as our leaders seem dumb enough to give it to them. This should be the clear basis for constitutional reform if the country is to move forward together, 170 years later. Instead there are continuing claims, and settlements, based on bloodthirsty conquest. The example of the fate of the Chatham Islanders is not unique. The Moriori paid a high price for appeasing the Maori. As will we if the relentless Maorification of our institutions continues. In the case that has interested me particularly here, concerning the south Wellington coast, we find that Ngati Toa showed no respect for Ngati Ira’s love of the land, customary title or wahi tapu. They killed them, enslaved them, and drove them out. Now their descendants demand the rights that were denied the former inhabitants of this land. Words change their meaning. Culture, tikanga, changes with time as well as differing between tribes. Wahi tapu is said to refer to a few artefacts but is then called upon to justify control of the whole Kaipara Harbour. And of course Kaipara Maori are using wahi tapu as an excuse to block the installation of power turbines on the harbour floor. 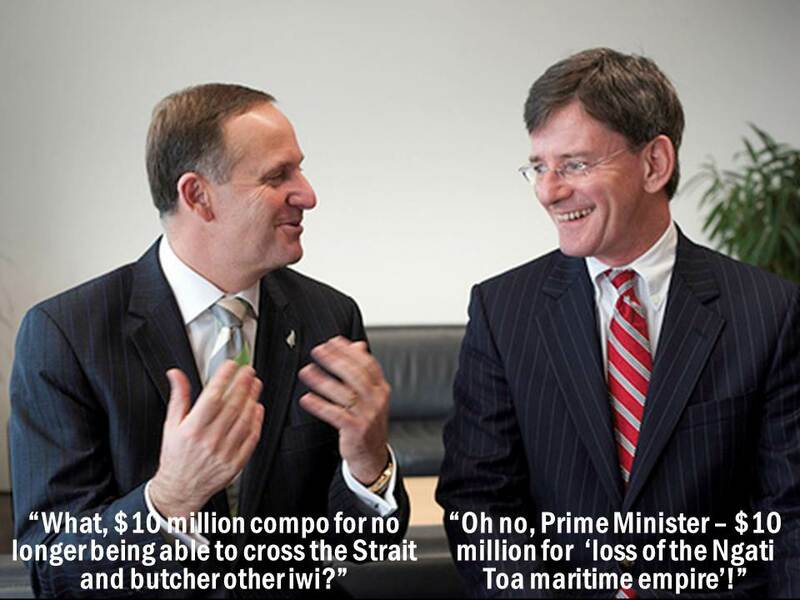 No doubt greasing the iwi’s palm with the appropriate bribe will quiet the upset spirits. Tangata whenua once was established by living in a place so that after just ten years in Wellington Te Atiawa could claim ownership and the right to sell that land. Ngati Toa and Te Atiawa only arrived in Wellington two decades and one decade, respectively, before the settlers. And yet they demand compensation of many millions of dollars. Now those who have lived their whole lives in a place, even for several generations, both Maori and non-Maori, are refused that status, which is claimed by descendants of the temporary residents of 1840, no matter where they now live. The focus is no longer on a search for the truth. History is reinterpreted and reinvented to suit political aims. Historical accounts may even be omitted when making settlements, or written by the complainant behind closed doors, out of view of the public whose money and land are being handed over. It’s time to expose the Maorification scammers, starting with the Appeaser-General who has made it all so very possible. I’ll be blogging on this and more in due course. You will read of the astonishing lengths to which Finlayson went to avoid saying the word ‘free’ when pressed by ACT’s David Garrett about public access to beaches during the Marine and Coastal Areas debate. You will read about the true history of the Treaty of Waitangi, including its fraudulent reinvention in the 1980s that kick-started the Maorification scam. By the time I’ve finished, the Treaty conmen will be thoroughly exposed, with no big words to hide behind. For now, I suggest you get a copy of The Corruption of New Zealand Democracy – A Treaty Overview by John Robinson. Waitangi Tribunal unbiased? You be the judge. Is the Waitangi Tribunal stacked to produce pro-Maori findings? But actually the present Tribunal has 22 members — 12 Maori, 10 Pakeha. As they say, approximately equal. But now let’s take a closer look at those 10 Pakeha members. It seems only three do not have clear affiliations to Maori in some way. I list the Maori credentials of the other 7 Pakeha below. You may find them interesting. You may wonder whether Pakeha so steeped in Maori culture are likely to produce a finding that’s fair to all New Zealanders. You may find that the true Maori-Pakeha ratio is not 12-10 at all, but more like 19-3. Approximately equal? I don’t think so. Now ideally, all members should view all evidence with no hint of bias. A Waitangi Tribunal member with an interest in Maori culture should be no different from a rugby referee from the home team’s country. But of course nowadays they have neutral refs. They do that because of a number of questionable decisions in the past that favoured the home team. Shouldn’t the same apply when deciding on matters which affect the division of a nation’s wealth? Chief Judge Wilson Isaac, Judge Stephanie Milroy, Dr Aroha Harris, Professor Sir Hirini Moko Mead, Kihi Ngatai, Josepth Northover, Professor Pou Temara, Keita Walker, Dr Ranginui Walker, Professor Sir Tamati Reedy, Tania Simpson, Dr Monty Souter. Student at Te Kawa a Maui in 2003. Completed Māori 101, having taken tuition in Te Reo Māori. Counsel for the NZ fishing industry when effective injunctions were secured by Māori to introduce the quota management system. Advocating for Māori on a wide range of Treaty issues and the kaupapa of Te Ao Māori. Counsel for the fishing industry in the High Court and Court of Appeal Māori fisheries litigation. Counsel for the fishing industry for the Tribunal inquiries into the Muriwhenua and Ngai Tahu fisheries claims. Legal counsel for the Treaty of Waitangi Fisheries Commission. Advised on Māori customary and commercial fishing rights and interests. Counsel for Māori in their claims before the Waitangi Tribunal. Counsel for Maori before the Māori Land Court and the Māori Appellate Court. Advised the parliamentary select committee on the Māori Fisheries Bill 2003. Advised the parliamentary select committee on the Foreshore and Seabed Bill 2004. Negotiated significant Treaty settlements for iwi including Taranaki Whanui/Port Nicholson Block Settlement Trust, Tainui Taranaki ki te Tonga, and the Māori aquaculture settlement. Published dispute resolution protocols for fisheries allocation for Māori. Took part in the first Te Papa annual Treaty debates in 2003–04. Authority on Māori customary history. Written papers for the Journal of the Polynesian Society. Member of the team producing the Dictionary of New Zealand Biography and Nga Tangata Taumata Rau. Responsible for the Māori side to this project. Books include Taua: ‘Musket Wars’, ‘Land Wars’ or Tikanga? – Warfare in Māori Society in the Early Nineteenth Century (2003); Iwi: The Dynamics of Māori Tribal Organisation, c1769–c1945 (1998), and Proud to be White? A Study of Racial Prejudice in New Zealand (1986). Academic qualifications include a COP in Māori Studies. Prepared evidence for the return of railways land to Wellington Māori. Researched projects for the Waitangi Tribunal and for claimants from the Hauraki, Kaipara, and Whanganui districts. Led research and exhibitions for the history and Pacific cultures sections of Te Papa Tongarewa (Museum of New Zealand). Preparing an historical overview report on the history of Tongariro National Park for the Tribunal’s National Park inquiry. Assisting the Wairarapa ki Tararua Tribunal as a consultant historian. Has been a research associate at the Centre for Māori Studies and Research, University of Waikato. Helped Ngāi Tahu, Ngā Iwi o Taranaki, and Waikato iwi prepare their Treaty claims. Written on Māori history and Treaty history. Was a member of the Turanga Tribunal. Sitting on the Urewera and Central North Island Tribunals. His book State Authority, Indigenous Autonomy(2004) examines the history of Crown–Māori relations. Professor of New Zealand Studies at the Stout Research Centre for New Zealand Studies at Victoria University of Wellington. Director of the Victoria University Treaty of Waitangi Research Unit. Worked in the Treaty of Waitangi resolution processes during the pioneering negotiations in the late 1980s. Sir Douglas Kidd, former politician. Former Minister of Māori Affairs. John Baird, former managing director. Studying for a bachelor of arts in Māori Studies. UPDATE: in response to a fair point made by a commenter, I should note that the above are just the Maori affiliations of the Pakeha members. I don’t mean to imply that either they or the Maori members don’t also have Pakeha affiliations. But this is a post about pro-Maori bias, not pro-Pakeha bias. My point is simply that these seven Pakeha members descend from the 85% of New Zealanders who are not Maori. Yet they have a high degree of fascination with the Maori culture, practised by only 15%. And that would be absolutely fine. Except that they’re employed to advise a government that’s meant to represent 100% of New Zealanders, not just 15%. Can they be relied upon to be fair to the other 85%? Dame Margaret Bazley, Joanne Morris, Basil Morrison. I’ll be having much more to say about the Waitangi Tribunal in the coming days. Outside South Africa, the word apartheid has never seemed so apt.